In the run up to his London show multi-disciplinary street artist Sickboy created five laser-etched coffins which were packed with artist ephemera, original sketches, exclusive Sickboy sticker packs and cosmic curio. Signed and numbered by the artist, each of the coffins were buried in shallow graves across the capital (one north, one South, one West and two in East London). The treasure Hunt took place on the morning of Friday 18th July with the Outsiders Galleryreleasing details of the hunt to their newsletter subscribers. The email included some hints as to the location of the buried treasure. For each of the five coffins an ariel view map was provided along with detail of a Sickboy temple flag marking the location of the buried treasure. 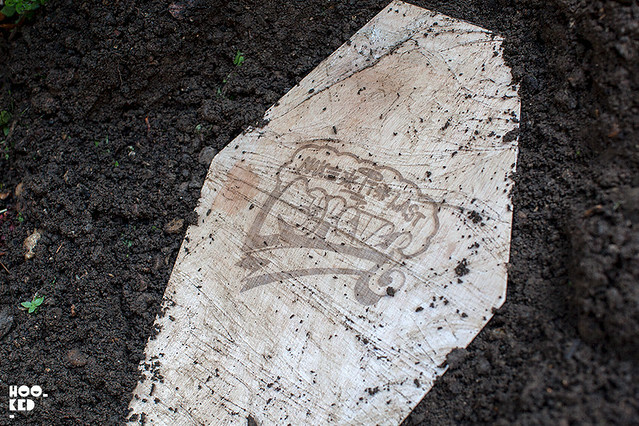 Within the hour images of exhumed coffins were starting to appear on instagram and twitter as treasure hunters began to share photos of their unearthed coffins We were also seeing images and hearing on twitter tales of hunters being beaten to the treasure by others or getting to the location too late only to find empty holes in the ground! As much as we wanted to join in on the fun and go hunting for the East London coffins, we were already running late for a meeting that morning and with a few hours having passed since the location map were emailed out we figured all five would surely have been found. 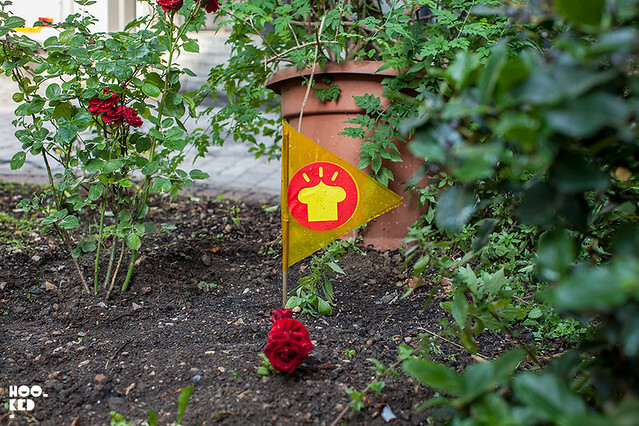 En route to Liverpool Street station we took a slight detour via Hanbury Street and were really shocked when we spotted one of the five Sickboy temple flags sticking up in a flower bed. 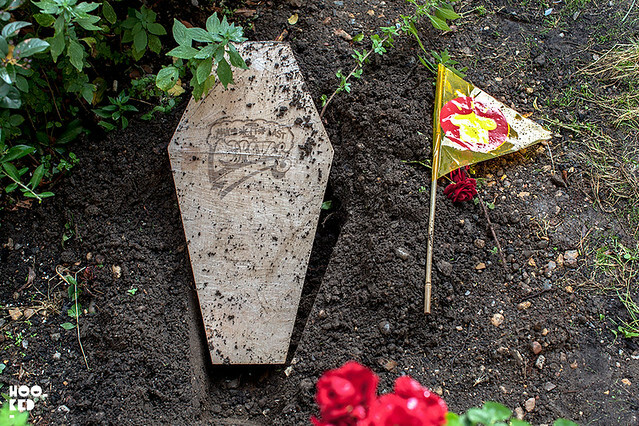 At first we figured someone had taken the coffin and left the flag behind, but after some digging, the hidden treasure buried beneath the dirt soon revealed itself. Grabbing a few snaps we removed the coffin from the ground, slung it under our arm and headed for the train station. Rocking up to our meeting a little later than we had planned saw some strange looks thrown our way as we turned up with muddy hands and coffin under arm! It was a few hours later before we got the opportunity to unglue the coffin lid and reveal the contents. Have a look at the Sickboy video which will give you an idea of the goodies that were to be found inside. Make It Last Forever will mark Sickboy's first London gallery appearance, a comprehensive showcase which will feature a unique body of surreal abstract canvases with an elaborate installation designed specifically for The Outsiders’ basement space. Make It Last Forever Exhibition opens with a launch party Thursday 24th July and will run at the space until Saturday 30th of August 2014. We've been pinning some of our favourite Sickboy pieces both outdoor and indoor work onto our dedicated Sickboy Pinterest Board go have a look at some of the artists other work.